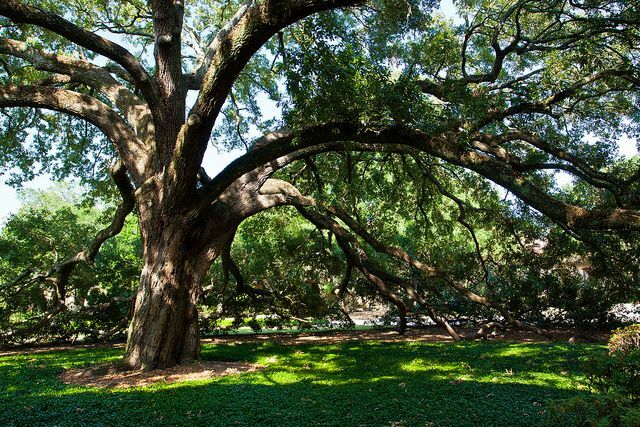 In 2013, LSU was nationally recognized for its historic live oaks. In early 2013, the national Arbor Day Foundation named LSU a Tree Campus USA for the first time. Tree Campus USA was created in 2008 to honor universities and colleges for effective management of campus forests and engaging staff and students in conservation goals. Since 1993, donors’ support of the LSU Foundation’s Endow an Oak program has provided immediate and long-term funding for the care of LSU’s renowned urban forest. Josh Anders and brothers Jason and Judd, all LSU graduates, recently endowed an oak in memory of their grandmother, Juanita “Neet” Crawford, a Louisiana conservationist. LSU achieved the title by meeting Tree Campus USA’s five standards, which include maintaining a tree advisory committee, dedicating annual expenditutres toward trees, having a campus tree-care plan, and hosting an Arbor Day observance and student service-learning projects. LSU’s campus is home to roughly 1,200 oak trees, and they are as much a part of the university as are its students, faculty, staff and historic buildings. Gifts of any amount may be made to the Foundation’s Endow an Oak program to support the general care and maintenance of LSU’s most treasured natural “residents.” An LSU oak can be endowed for a gift of $4,000, of which $2,000 builds the oak endowment to provide perpetual support and $2,000 can be used immediately by LSU’s arbor management team.